Bands that formed in the mid-1960s and beyond capitalize on nostalgia tours, and Chicago-spawned alt-rock icons The Smashing Pumpkins reached their commercial and critical peak a full 30 years beyond that time frame. 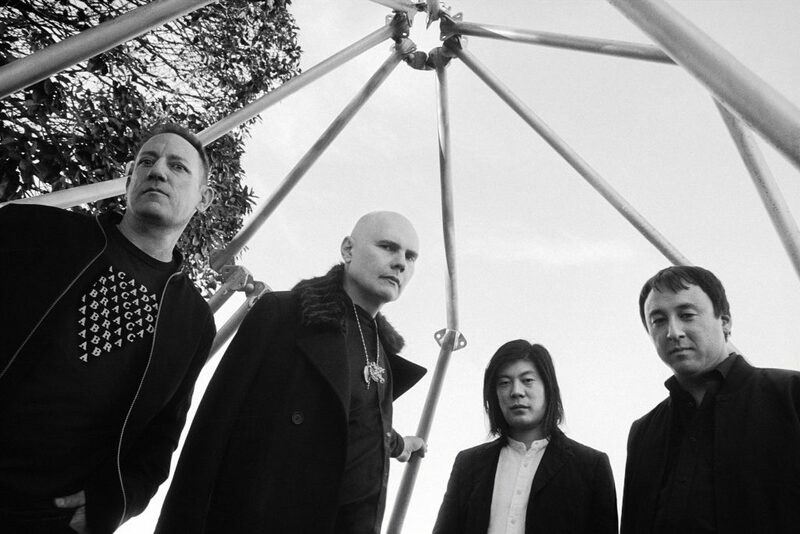 When lead vocalist, guitarist, keyboardist and band leader Billy Corgan was able to rein in original members James Iha (guitar, vocals) and Jimmy Chamberlin (drums) this year, he sweetened the pot for touring – the primary earning vehicle for performers in the post-major recording label era – by additionally making this a “reunion” run. Never mind that original bassist D’Arcy Wretzky and the mercurial Corgan couldn’t agree to terms that would’ve completed the original quartet lineup. And that the Pumpkins haven’t released a new album since 2014, recently opting for the new-school option of an online single, “Solara,” with longtime guitarist Jeff Schroeder as the fourth member. On July 24 at American Airlines Arena in Miami, the Pumpkins’ Shiny and Oh So Bright tour featured an expanded lineup with the additions of keyboardist, guitarist and vocalist Katie Cole and bassist Jack Bates. The sextet performed a 31-song marathon set that occasionally shone, yet lacked consistent brightness throughout – primarily because of Corgan’s notorious self-obsession rising to the fore. First up was a 45-minute set by Canadian opening act Metric, a Toronto-spawned quartet featuring vocalist/keyboardist/guitarist Emily Haines, guitarist/keyboardist/vocalist James Shaw, bassist/keyboardist/vocalist Joshua Winstead, and drummer Joules Scott-Key. Together now for 20 years, the band started out performing for a sparse fraction of what would eventually become a 90% full arena, and did an excellent job of filling it to half-capacity by set’s end. Haines proved a commanding presence, rocking both a straight microphone stand and hand-held mics and energizing the crowd with her unofficial, non-stop step class. The only times she stopped moving were to play guitar or keyboards, and she, Shaw and Winstead all intermittently playing keys lent elements of 1980s pop and New Wave acts like The Cure, Depeche Mode and INXS. But Metric most owned the stage when it avoided the mid-tempo pop and rocked a la Chrissie Hynde’s original Pretenders lineup, exemplified by the quartet’s raucous delivery of “Satellite Mind,” from its 2009 album Fantasies, featuring both Haines’ vocal growling and stage prowling. Thirty minutes later, it was time for the Billy Corgan show. Or maybe it just seemed that way. The shaved-headed maestro emerged alone with an acoustic guitar, performing “Disarm,” from the 1993 gem Siamese Dream, while accompanying various projected photos of him in different stages of boyhood. It would be the first of several videos featuring only him. “Rocket,” from the same album, featured the entire band, but also Corgan’s thin, nasal voice straining to hit its highest notes. And “Siva,” from the band’s 1991 debut Gish, featured an abundance of Corgan solos before Schroeder finally took his own break amid Chamberlin’s percolating drumming. Corgan’s self-obsession continued with his preaching video interlude to introduce the rollicking “Zero,” from the 1995 release Mellon Collie and the Infinite Sadness. But in the now-sizable crowd, certain distinctions were evident. There were the Pumpkins fanatics, enjoying every note; parents who’d brought their kids, who seemed to be enjoying watching their parents’ reactions as much as the music, and a large portion who seemed as far away as the going-through-the-motions band leader. Corgan wouldn’t even address the crowd, awkwardly leaving that to Iha. The sextet thankfully warmed up midway and salvaged the evening, surprisingly by going to slower, more esoteric material. “Soma,” from Siamese Dream, featured Cole’s vocal harmonies and acoustic piano; Iha (whose lead vocal spotlight on “Blew Away” later took things back down a notch) on backing vocals, and intense volume swells. “To Sheila,” a ballad from 1998’s Adore, literally put Corgan on a pedestal, where he played piano and delivered one of his better vocals on this night. “Porcelina of the Vast Oceans,” from Mellon Collie, proved the Pumpkins’ best original rendition shortly thereafter. Building from whispering and dirge-like to boiling, through the simultaneous guitar histrionics of Corgan, Iha and Schroeder, the lengthy piece’s latter moments showcased Corgan’s most effective soloing, complete with him de-tuning his guitar at the end. A curious acoustic cover of Fleetwood Mac’s “Landslide” continued the unevenness, courtesy of Corgan’s questionable instrumental and vocal notes, and caused Iha to rally the troops. “Miami, are you still with us?” the guitarist asked. The audience certainly would be shortly thereafter, as Corgan and company hit on a cover that brought down the house. Seated near the front of the stage and playing electric piano, Corgan launched into the intro to Led Zeppelin’s “Stairway To Heaven,” practically guaranteeing a forthcoming epic or cringe-worthy series of moments. Halfway through, when he delivered the irreverent line of “Does anybody remember laughter?” that Robert Plant uttered in the live version from the 1976 concert film soundtrack to The Song Remains the Same, things looked iffy. But the crowd started singing along afterward, Chamberlin’s thunderous drumming mimicked John Bonham’s, and Schroeder played a stirring, note-for-note rendition of one of Jimmy Page’s most memorable guitar solos. Having finally won the crowd over, it was time for the band to play several of the originals they’d made the crowd wait to hear, including a too-fast version of the frenetic rocker “Cherub Rock” (from Siamese Dream), the poppy hit “1979” (Mellon Collie) and the metallic “Hummer” (Adore). The first encore was the new “Solara,” a surprisingly-retro rocker that echoes elements of AC/DC and Guns ’n’ Roses. The final encore was a theatrical “Baby Mine,” a ballad that Betty Noyes sang in the 1941 animated Disney film Dumbo. Perhaps it signified Corgan pointing back to childhood and its effects on him since, a recurring theme. It’s a story line that’s helped create a signature sound by the Chicago-spawned band, one based in introspective lyrics, alternate guitar tunings, and largely un-syncopated, highly Caucasian rhythmic patterns that can seem ironic when considering its birthplace in one of America’s blues hotbeds. All due credit to Corgan for being the primary creator of that unique sound, with ample contributions by Iha, Chamberlin and Wretzky. But in his control-freakiness, Corgan needs to remember those contributions by others. He’s always considered himself the only essential band member, which has created slippery slopes for groups throughout music history. And as a nostalgia act, one primarily playing material from its first 10 years and not the most recent 20, the leader of the Smashing Pumpkins needs to be more respectful of his audience. Otherwise, he’ll lose the essential ingredient that’s the root of it showing up to watch him in the first place: relevance. Thanks for the summary of the not-so-smashing show. I probably would have been able to enjoy it, but I think I was busy working with Big Medicine. Rock on!